Which elements or constructs are searched is defined by a set of rules; the following table gives a short summary of rules currently checked by AdaControl. The number in parentheses after the rule name gives the number of subrules, if any. Considering all possible rules and subrules, this makes 532 tests that can be performed currently by AdaControl! 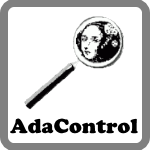 AdaControl analyzes a set of Ada units, according to parameterizable controls. Controls can be given from the command line, from a file, or interactively. There is a wide range of controls available. Control occurrences of special strings in comments (like TBD for “To Be Defined”), with full wildcarding. AdaControl integrates nicely in environments such as GPS (see Running AdaControl from GPS), AdaGide (see Running AdaControl from AdaGide), or emacs (see Control kinds and report messages). In those environments, you can run AdaControl from menus or by just clicking on a button!